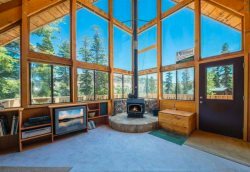 This "Meadow Stone Lodge Beauty" has luxury, location and warmth! The open living room makes for a wonderful gathering place for your family and friends. There are two living room sofa areas for guests to enjoy two separate spaces but still all be together, which are connected to a large dining space and balcony. Views of the ski slopes are just outside your door where you can relax and BBQ too. Fresh new construction also shows it best with granite counters, radiant baseboard heating, wood windows and a balcony facing the meadow and slopes. This home is three bedrooms and all have their own bath access. The over-sized open floor plan makes this condo perfect for large families coming together for a mountain escape. The master suite boasts a Kohler jetted tub, plush king bedding, fireplace and a separate lounge and work area. There is plenty of room for the kids in the bunk room with 2 bunks (4 twins). The third bedroom has a queen bed for your comfort. There is a closet in the master with a bunk bed which could sleep two kids. The door is off and open into the master bedroom area. Meadow Stone Lodge is absolutely the number one preferred vacation rental complex in Kirkwood. The reason is you are located in the center of all the action from cross-country out the back and getting on the lifts in the front. Meadow Stone Lodge is located just steps from one of Kirkwood Mountain Resort’s best known chair lifts, Cornice Express. Comprised of 34 rustic luxury residences, Meadow Stone Lodge offers luxurious two, three, and three bedroom plus loft condominiums, each outfitted in rustic style and equipped with all the comforts of home. The romantically tall towers surround a natural landscape of aspen trees and a stone-laden creek that greet guests as they enter the covered parking garage and entry lobbies. At Meadow Stone Lodge, you’ll stay just steps from the resort’s premiere downhill ski area as well as the Kirkwood Meadow, where you’ll find ample space for snow play and well-maintained cross-country and snowshoe trails. Heated driveways and sidewalks provide safe, easy building access, even on the stormiest days. Upon arriving, you’ll find warm, welcoming hallways and plenty of luggage carts to allow you to unpack your gear with minimal hassle. Plenty of books and games!